A clutch of factors, including skyrocketing crude oil prices and the ensuing presidential election, have propelled the issue of fuel economy of vehicles to the foreground in the us. While the United States Environmental Protection Agency (usepa) appears to be in reverse gear on the subject, the country's presidential candidates have gone overboard and promised an oil-free future. Even carmakers are suggesting methods to curb petrol consumption, though in ways that will not hurt them directly. Given the fact that cars and light trucks account for roughly 40 per cent of the total oil consumption in the us, tightening fuel-efficiency standards is a critical matter. The issue has been attracting considerable attention lately, with the price of petrol hitting a record high in the us. This was primarily due to the steep rise in crude oil prices. Even as light sweet crude in the us stood at us $38.35 per barrel on March 17 -- its peak level in 13 years -- fears were expressed that the price of oil could reach us $40 a barrel. The situation came to such a pass after the Organisation of Petroleum Exporting Countries (opec) decided to reduce oil production by 4 per cent (one million barrels per day) from April this year. The International Energy Agency reacted strongly to opec's move and observed: "Higher (oil) prices are contributing to stubbornly high levels of unemployment and exacerbating budget-deficit problems in many oecd (Organisation for Economic Co-operation and Development) and other oil-importing countries." A controversial development that took place in the us in January also contributed to the chaos. Transnational company Royal Dutch/Shell announced that it had overestimated its oil reserves. According to the us department of energy (doe): "High crude oil costs, strong gasoline demand, low gasoline inventories and more stringent gasoline specifications this year have increased marginal gasoline supply costs and retail prices to high levels well before the peak driving season." Unsurprisingly, the prevailing oil scenario in the country has spawned a game of political one-upmanship between the Democrats' presidential hopeful, John Kerry, and the Republican incumbent, George W Bush. The former has promised a reduction in consumption of two million barrels of oil a day -- the amount the us imports from West Asia at present. Though Kerry wants to raise the fuel economy standards from the current corporate average of nearly 12 kilometres per litre (km/l) to just over 15 km/l by 2015, he has unveiled a rather grandiose scheme for five years later. By 2020, he promises to use hydrogen throughout the us. This, he points out in his energy plan, would "power our cars at 100 miles per gallon (over 42 km/l)". Bush, who is seeking re-election, is already making the right noises about a hydrogen economy for the us. Experts are, however, of the opinion that a substantial move towards a hydrogen economy is still a quarter of a century away. Going off-track For all the gesturing, the actual process of pushing the automobile industry to meet more stringent fuel economy norms remains a politically sensitive issue. In 1993, the us government had declared a partnership for new generation vehicles (pngv), which envisaged building a super car by the end of 2001. This vehicle was supposed to run at about 34 km/l of petrol or its equivalent. But the Bush administration decided to jettison the us $1.5-billion eight-year project, and replace it with a plan to develop hydrogen-based fuel cells to power the cars of the future. The new programme, called FreedomCar, however, does not set any target for the automakers to produce a fuel cell-powered vehicle. Energy experts feel that in the absence of a time schedule, such measures would not prove efficacious. The us, with only 5 per cent of the world's population, consumes 25 per cent of its oil -- mostly in the form of gasoline. The vehicle manufacturing industry has steadily resisted government-mandated increases in fuel economy, with some carmakers arguing that such stipulations would divert investment from fuel cell research. For instance, auto giant General Motors (gm) claims that strengthening fuel economy standards could cost it us $1 billion and force changes that would make its vehicles less safe. The federal Corporate Average Fuel Economy (cafe) standards -- the us government's fuel efficiency guidelines -- were first adopted by Congress for the industry in 1975 after the oil crisis. They require passenger cars to average almost 12 km/l and light trucks to get a mileage of less than 9 km/l. These norms have remained unchanged for over a decade. When they were formulated, light trucks were allowed to get lower mileage because they were mostly used by farmers and small businesses. Now, sports utility vehicles (suvs), pickups and minivans account for half of the country's vehicle sales and tend to be used as cars. The main reason for the surge in sales of these fuel-guzzlers is that gasoline prices in real terms are much lower now, avers Dan Ackman, analyst with Forbes . Predictably, therefore, the average fuel economy of the us vehicle fleet dipped to 8.8 km/l during the 2003 model year. 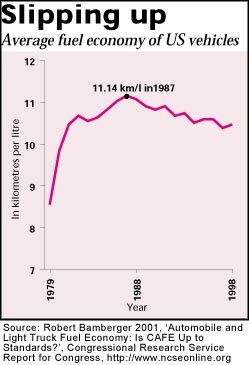 And this was a part of the declining trend (see graph: Slipping up) that has pushed petrol vehicle mileage 6 per cent below its 1988 peak. A recent study published by environmental group Bluewater Network also reiterates that the on-road fuel economy of vehicles in the us actually works out to less than 9 km/l . Consequently, the usepa is now considering revising its method of calculating fuel economy. Even the small steps to improve the fuel efficiency of vehicles -- particularly light trucks and suvs -- have been watered down. In 2002, when the National Highway Transportation Safety Administration (nhtsa) recommended that the cafe standards for light trucks and suvs be increased by 1.5 miles per gallon (0.6 km/l) in the model year 2007, officials of the White House Office of Management and Budget decided to phase in the norms more gradually. nhtsa notes that the new standards would provide us $249 million in benefits to society and save 13.6 billion litres of gasoline over a 25-year period -- about 1.5 per cent of the total consumption. But nhtsa head Jeffrey Runge supports fuel economy standards beyond the 1.5-mile-per-gallon increase set to come into effect by 2007. "We can do better," he asserts. Pampered as they are, some major vehicle manufacturers in the us are averse to following stiffer rules. As a diversionary tactic, they suggest alternative measures to curb fuel consumption. Bill Ford, chairperson and chief executive of Ford Motor Company, recently said that he would support higher fuel taxes in exchange for incentives to promote energy-efficient vehicles. G Richard Wagoner Jr, the chairperson and chief executive of gm, reportedly concurred: "If you want people to consume something less, the simplest thing to do is price it more dearly." To be sure, fuel prices in the us are extremely low compared to other countries. Federal Energy Information Administration figures suggest that in April this year, when prices for premium petrol averaged us $1.96 a gallon (3.8 litres) in the us, the price of a similar grade of fuel in Germany was us $5.19 and in the uk it was us $5.34. Other regions of the world are also better-placed than the us so far as their mileage programmes are concerned. The environment minister of Canada recently announced that his government might impose fuel economy standards on major automobile makers if they don't agree to improve the fuel efficiency of their vehicles by 25 per cent between 2008 and 2010. According to reports brought out by the us-based World Resources Institute, even China is planning to put in place fuel efficiency regulations that would be tougher than those of the us. Keeping up its aggressive campaign against environmental pollution, Japan's Tokyo metropolitan government, too, has taken the initiative to raise the energy efficiency of vehicles. Likewise, in December 1999, the eu passed a directive requiring the measurement of carbon dioxide emissions and fuel consumption performance of passenger cars within the bloc. Over the period 1995-2001, new petrol and diesel cars in Europe reduced their average fuel consumption from 12.7 km/l to 13.7 km/l and 15.2 km/l to 17.2 km/l, respectively. Although there are no rules governing fuel economy in India, some manufacturers have taken initiatives on this front in view of the market being price-sensitive. The Society of Indian Automobile Association of India says: "In the current competitive environment, fuel efficiency is crucial; it is a unique selling proposition for manufacturers." In the meantime, a committee headed by fiscal expert Raja Chelliah has proposed a resource tax that directly targets fuel consumption of vehicles. As per this, the most fuel-efficient vehicles would be exempt from the levy while the biggest guzzlers will be taxed at the highest rate. The recommendations are, however, yet to be accepted by the Union government.